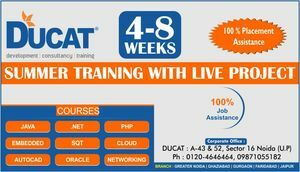 Now ducat the top it industrial training institute offers Limited seats for Industrial Project Training & Internship in noida, Ghaziabad, Gurgaon. Eligibility - MCA / B. Tech /B. C. A / B. E / MSC (IT & CS). Project Training will include: Learning, Training, Case study, Presentations, Problem solving and Live Project .